Trained therapy dogs will be available at the Library to be attentive, non-judgmental reading partners for children reading aloud. 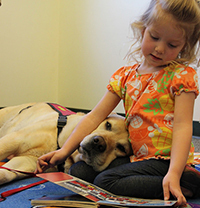 Children have individual 20-minute appointments to sit with a dog and read. To register, e-mail tales2tails@santacruzpl.org or call 831-427-7717.